Mike Dillard Reviews - Legit or Scam? Mike Dillard Reviews – Legit or Scam? MikeDillard.com is the website of Mike Dillard, an entrepreneur who says that his mission and purpose in life is to empower people who want to change their lives with the knowledge and skills they need to do so. Unfortunately most people feel that a huge obstacle to being able to do this is having the financial means they need to reach their achievements. Mike Dillard wants to help people reach their financial goals so they can reach their life goals, and make themselves – and the world around them – better. 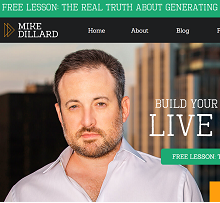 The Mike Dillard website offers a large variety of options for newcomers, breaking up the information on his site into categories like Build Your Business, Build Your Wealth, Marketing, Mindset, Personal, and Self-Reliance. He is also well-known for a self-help podcast, called Self Made Man. He also offers the Self Made Man Society, where he helps people learn how to come up with ideas for their next business, as well as to transform your health and energy, and “create your legacy.” He describes this membership opportunity as perfect for people who are interested in having a successful personal mentor for both life and business. His website also features List-Grow, a step-by-step program for understanding exactly how to build a large audience and email list for your business, as well as Tiger 21, a group whose goal it is to support companies, foundations, and entrepreneurs who want to contribute to society. It is clear that Mike Dillard has been very successful in his life path and business choices; he says that he made his first million dollar business by the age of 27 by teaching other small business owners how to market their products and services online. In addition, he says that his combined businesses have earned more than $50 million in revenue without outside funding. Unfortunately some people have complained about some of his program offerings, because they were under the impression that these services would teach them how to build a business from the ground up, when they eventually found out that most lessons were about taking an existing business to the next level. Other reviewers stated that they wanted comprehensive marketing teaching and tools, and were disappointed that the service they purchased only focused on online marketing. This goes to show that prospective customers will want to pay close attention to the product or service they are considering purchasing, to see who will really benefit best from it and what skills and knowledge are being taught. Mike Dillard and his website appear to offer so many different choices and options that there shouldn’t be any need to compromise what you want or are looking for. Perhaps the best place to begin will be with any free resources offered by Dillard, including his podcast and his website blog, as these will give customers the best understanding of Dillard, his teaching style, and how it may be possible to benefit from any of his programs. Do you have experience with Mike Dillard or one of his companies? If so, please leave a review below. Average Rating for " Mike Dillard " is 2.33 out of 5 based on 21 reviews. (FAILURE TO REGISTER AS AN INTRODUCING BROKER) and soliciting clients to trade. No matter how sincere he may of been to wash his hands of all responsibility for soliciting clients to trade, by using vulgarity , the courts have the final say. Mike apparently promotes the importance of being transparent and trustworthy on the EVG website and yet I am yet to hear him come out and say openly that he broke the law . I am looking for a mentor or a legitimate program that helps entrepreneurs like myself market innovative useful products such as Mike promises. Are you in this business, and suggestions ? Mike dillard's products are not worth buying. You can go on YouTube and see tons of people who started promoting his products over three years ago. Now they don't even come back on YouTube to answer any questions you have about Mike's Dillards products. More than likely because they weren't successful promoting his products. Seems like if you were being successful promoting Mike Dillards products, you would be happy to answer any questions about his products. "The Elevation Group" stinks of scam. Quite a polished and well-organized one at that. Save your money, and as the above poster recommends read Peter Schiff's excellent book and get all the relevant information for a tiny fraction of what 'Mike Dillard' is asking for. This is what I was looking for. If it's too good to be true it probably is. Thank you for this site. It took me a while to find it. He owns the google web search on his name. I wonder how long it took him to do that??? i truly think is a scam, Mike Dillard makes his money by taking advantage of gullible people that are dreaming in making an easy buck, i feel guilty for introducing my friend to it, he signed up and pays $97 a month to watch videos you can watch for free on you tube. don't fall for it! Go ahead - judge for yourself. If you swamp the web and get fake reviews all over the place, your business cannot be legit. Elementary, my dear Watson. Mike Dillard charges a lot of money to show you how to protect your money in the coming crash. Why not buy Peter Schiff's book Crash Proof 2.0: How to Profit From the Economic Collapse at $11.56 from Amazon that is ten times more comprehensive? You can listen to Peter Schiff advice on youtube or on his radio show. He does not hide the information so you buy his product. He gives you all the information for free and you can even call him on his show and get free advice. Once you know the man and trust him he hopes that you use his company to allocate your fund when he works for you as a broker. Don't waste your money on people who get rich by selling you information. Go to the real source. The information is free. Schiff charges only for his services, if you use his company. Sorry....Asking about Peter Schiff's Company. And thanks for your review of M.Dillard. Mike Dillard is very slick at marketing over the internet. But, I found the content of his Elevations program to be fairly useless. I signed up for Elevations Group last Spring. The promised publishing deadlines were continually missed and the basic business concepts that were provided are readily available for free from myriad sources. I asked for my $ back and was told the 30 day guarantee was passed. Turns out the 30 days to evaluate didn't start from when I received the program but from when I ordered it, even though they still hadn't completed their web site when I asked for the refund. My credit card company agreed with me however and I was finally able to get my $ back. My over-all experience with them was aggravating and a waste of time. This is an obvious and pathetic attempt to drown out legitimate criticisms of Mike Ballard and his WWN scam. These scumbags are nothing buy lying con artists attempting to swindle gullible people out of their money. Okay. It is pretty clear the whole Elevation Group and Mike Dillard are well organized scams. Their group has posted fake criticisms of themselves to hijack the google search terms with their names and 'scam'. No legitimate company has everyone loving them! And definitely, you won't find glowing reviews when you look for criticism of them. This is just a really well organized cyber scam -- pretty clever: they capture all the search terms and drown the web with their brain washing. Not bad.